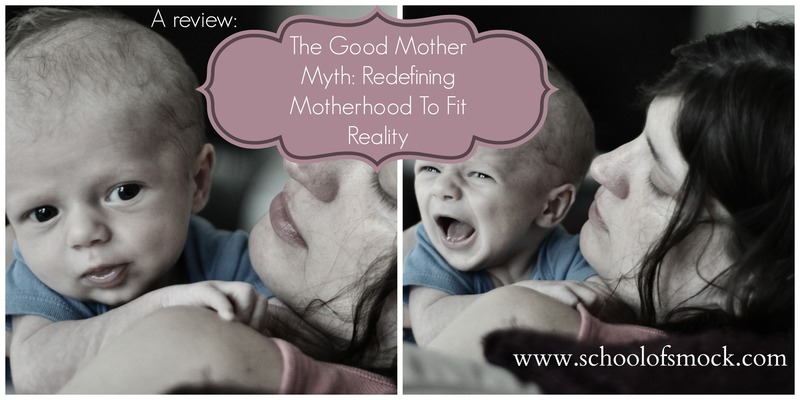 Long before I was an actual mother, I aspired to become merely a Good Enough Mother — and avoid the grasp of the Good Mother Myth — but its grasp was too strong. Just like it has been for the 36 women who wrote the diverse and provocative personal essays in The Good Mother Myth: Redefining Motherhood to Fit Reality , edited by one of my first favorite bloggers, Avital Nathman of Mamafesto. I wanted to believe that I was unique somehow in wanting to avoid the impossible standards of maternal perfection that our culture sets for us. I believed that I was different than other mothers, for a few different reasons, and maybe those differences would shield me. First, I wanted to believe that because of the model of my own childhood I would reject the idea that there was a single, “right” way to be a mother. I was a true “free range” kid — before there was such a term — growing up on a farm in the Adirondacks. My mother didn’t agonize over her choices. She didn’t hover, didn’t obsess about what we ate, how we learned, or how we felt. Second, I wanted to believe that because of the unexpected lessons that I learned about parenthood as a private school teacher that I would avoid this myth. I saw what happened when high-achieving, perfectionistic moms devote all of their energy and time to their child. From what I observed, they seemed pretty miserable and their children often suffered, becoming anxious and overly dependent on adults. Finally, I wanted to believe that because of my scholarly knowledge of the destructiveness of these maternal standards that I would be immune. I had written a thesis on the transition to motherhood and knew all of the academic texts and theories about maternal anxiety and pressure. (My copy of The Cultural Contradictions of Motherhood from the 1990s , one of the original books about the effects of hyperparenting on women, is tattered and covered in notes and highlighting.) Most of my early graduate work was about feminism and motherhood. Yet despite these experiences and knowledge, I was not unique nor immune. The forces of guilt, competition, and judgment were too strong. During my pregnancy I was able to sustain what I thought was a healthy, relaxed attitude about the choices that I would soon face as a mother. I hired a doula and went to natural childbirth classes, but I told myself that I would also be okay with an epidural, if I felt like I needed one. I prepared to breastfeed — taking a class during my pregnancy, buying breastfeeding books, and researching all the accessories (pillows, covers, pumps, bras) that I might need, but I told myself that it wouldn’t bother me if breastfeeding somehow didn’t work out. I was sure that despite my own perfectionism, sometimes anxious temperament, and often competitive attitude, I would be that Good Enough Mother. I would be different. The one who’s relaxed with her kids, always. The one who doesn’t let the pressures of the playground or Pinterest affect her own conception of herself as a mother. It didn’t work out that way. It started early in my life as a mother, very early. I was still in the recovery room after an endless night of labor and pushing, followed by a harrowing, panicked emergency c-section that felt like something out of an operating room on a battlefield. A new doctor came into my room and tried to explain — very clinically — once again what had happened, why a seemingly routine labor ultimately resulted in such a difficult childbirth experience, one that could have easily ended without a successful outcome. He said that my son’s umbilical cord was too short for him to be delivered vaginally and that it was hard to detect this through normal ultrasounds during pregnancy. He said that they usually rely on reports from the mother about decreased fetal movements to investigate this possibility more thoroughly. No, I hadn’t noticed. Well, that wasn’t entirely true. I did wonder why my son didn’t move as often as my other pregnant friends’ babies did, but I didn’t bring it up to my OB/GYN and didn’t think much of it. I was a first-time mother and had no idea what was “normal” in terms of fetal movement. This feeling — that achy, icky feeling in the pit of my stomach or sometimes right in my heart — is one that I’m now familiar with. It’s happened during a new mothers group meeting when another new mom told me that she was able to keep breastfeeding, despite her son’s severe allergies, and that it wasn’t too late for me and my son. I had stopped breastfeeding because I was too exhausted to work with a dietician to modify my diet because of my son’s severe dairy and soy allergies. And also because I didn’t want to breastfeed anymore. But in that moment, with this other happy and shiny faced mother telling me that she had succeeded at something that I didn’t, I felt like a horrible mother. I could go on. The examples are endless. As time has passed, I’ve become much more confident in my choices. But I still feel it. That achy feeling in my stomach when I’m sure that I’m not meeting what is expected of me as a mother. After reading this book, I’m more sure than ever that the way to cope with the anxieties and stress that we all feel as mothers (at least sometimes) is to share our stories. For me, this was the most powerful effect of this book: I realized in a real and moving way that I was not alone. I was not alone in not meeting all the maternal standards that our culture holds up for us, as well as the ones that exist primarily inside my own mind about the “right” way to be a mom. However, I didn’t feel “not alone” in a self-help, preachy sort of way. These aren’t those kind of stories. These essays are raw, bold, and sometimes even defiant, exploring topics as diverse as the gender imbalance in school volunteering, mental illness, racial stereotypes, marijuana use, and infant prematurity. These stories are all confessional and interesting in unique ways, but together as a collection they are even more powerful. Because it’s not on the basis of one story, one woman’s voice that we will be successful at debunking this mythology of the perfect mother. We will only be successful when more and more of us share our stories with each other, listening without judging, empathizing without criticizing in our own minds, and learning without comparing or competing. How has the Good Mother Myth affected you? Do you try to challenge it? Check out today’s posts from the other Brilliant Book Club writers and join the Brilliant Book Club on Facebook to continue the discussion! Jessica, so honest and lovely as usual. Reading your essay right after Deb’s, the question that looms largest in my mind is what is it that makes us prone (or not) to the negative forces of the Good Mother myth. You give convincing reasons why you should have been immune, and yet, and yet. It occurs to me as I have been mulling this over that the Good Mother has an ability to strike different nerves in each of us and those nerves are usually telling of aspects of motherhood which are particularly important to us or at which we genuinely want to be doing better. I believe, with you, that there are many types of Good Mother and I love the book’s project of enshrining that diversity. But I’m not sure the Good Mother myth itself is as singular as the Introduction would lead us to believe. My version of the Good Mother, for instance, does not craft or volunteer on the PTA ;). She does, however, scream less and her almost three year old definitely sleeps through the night! It is so comforting to know we are not alone in our missteps and in the non-ideal outcomes of our parenting choices, but I still want to work on these. The icky feeling in my stomach you describe so well helps me to discover what it is, deep down, I should be focusing on. It’s like a spotlight, which I need sometimes, because I am very good at hiding things from myself! I can really relate. My kids are 16 and 18 and I still feel like every other mother I see at all the basketball and baseball games is a far better mother than I’ll ever be. And then, I stop and remind myself that I am the right mother for MY kids and this is how I raised them and they’re great kids. It’s very hard not to compare…..thanks for such an honest post. So interesting. I wonder if that first, traumatic birth experience really did have such a lasting effect on your confidence as a mother. I second Lauren’s comment… it’s hard for me to imagine you as anything but confident, and true that you had every reason not to “fall prey” to the myth of the good mother. It is, perhaps, simply the fact of being human, that we are all susceptible to one myth or another? This is fascinating to me. Not only do I love this subject, but it’s very interesting that in spite of your background, education, research- not even YOU were immune from succumbing to those feelings of inadequacy and doubt. If that’s the case for someone with as much experience and insight as you- how can any mother be expected to not fall into this trap? I still cringe at that whole breastfeeding-shaming incident, and I also feel that it’s insane that a doctor would ask a *first-time* mother why she didn’t feel more fetal movement? What on earth were you supposed to be comparing it to? But it’s seemingly benign statements such as those that continue to trigger this response in us- were the “myth” not so pervasive, perhaps our reactions to those comments would be less painful, doubt-filled, and emotionally charged. Such an honest, affirming post. I’m loving following this discussion–all your posts and even the comments you’re leaving for each other. Such deep, thoughtful reviews. I haven’t read the book yet, but I intend to! What a great piece. I have not yet read the book but I do intend to. My girls are 10 and 7 but those feelings of failure in early motherhood are still raw. It is amazing the pressure that we put on ourselves despite cognitively know all the facts. Thank you for sharing this! jack, then you can still use a battery, but you’ll have to use an inverter.